School of Informatics academics, Professor Adrian Cheok and Dr Jon Bird, raise City's profile through their applied research. City University London Pervasive Computing academics, Professor Adrian Cheok and Dr Jon Bird, are working on innovative ways of using mobile phone technology. Pervasive Computing is an ever rising trend towards embedding microprocessors in everyday objects such as mobile phones, kitchen devices, or items of clothing. Pervasive Computing systems imply consistent connectivity and availability. Professor of Pervasive Computing, Professor Adrian Cheok - founder of the Mixed Reality Lab - explores mixed reality, human-computer interfaces, wearable computers and ubiquitous computing, fuzzy systems, embedded systems and power electronics. This encompasses work in 'empathetic communication', by digitally conveying smell and touch. He has also been carrying out research into digitally actuating a sense of taste by actuating the tongue through electrical and thermal stimulation. 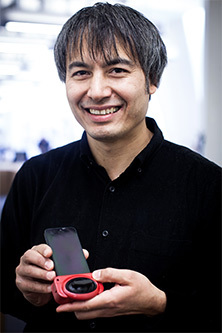 On 8th October, Professor Cheok appeared on BBC World Service's flagship technology programme, Click, with presenter Gareth Mitchell, to demonstrate his work on a device and app which transmits smell via text on a mobile phone. Professor Cheok also recently delivered a Digital Taste and Smell presentation to the third top chef in the world, Chef Andoni Luiz Aduriz, at Mugaritz restaurant in San Sebastian, Spain. Chef Andoni will be working with Professor Cheok and City PhD students to develop the world's first mobile gourmet smell device. "Imagine a world in which you can only look out to the world through a window and just touch glass. This is how we presently interact with computers and the internet. Human beings, however, learn and experience with all of their senses. At City, we are extending the world of the computer and the internet to all the five senses, including touch, taste, and smell." Professor Cheok is working at the The Hangout, City' unique university incubator space in the heart of London's Tech City, to commercialise an interactive haptic ring to transmit touch through the internet. Dr Jon Bird has carried out work on tactile technologies, energy awareness and conservation through Pervasive Computing and the design of lambent devices to assist shoppers. He is also the co-creator of the MIVA mobile phone application which permits field workers to visit the relatives of people who have died to create 'verbal autopsies' and record data about their death. This has proven to be useful in African countries such as Malawi where access to hospitals may be challenging. The technology "has the potential to revolutionise our understanding of global health". "In our Pervasive Computing research we are not only developing novel technologies but we are also finding novel ways of using everyday technologies such as mobile phones. 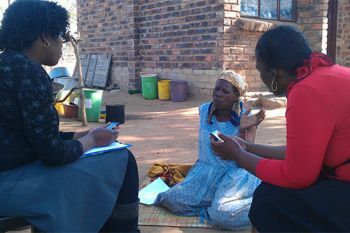 MIVA demonstrates the power of this second approach by providing a cost effective solution to a pressing public health issue in the developing world: recording deaths and analysing their causes in a rapid and systematic way." Please visit this website for the BBC 'Click' episode featuring Professor Cheok. For the BBC (Health) World News story on Dr Jon Bird's MIVA research, please visit this link.